A former surface and underground Cu-Pb-Au-Ag-Zn mine located in the center sec. 22, T.16N., R.2E. (Clarkdale 7.5 minute topo map). Discovered 1875. Started about 1876. First produced 1883. Claims extend into the NW¼, the N½SW¼ and the W½W½NE¼ of sec. 22, and the S½SW¼ of sec. 15. Mineralization is a steeply-dipping, cylindrical body approximately 700 to 800 feet (215 to 246 meters) in diameter, extending down to a depth of 2,400 feet (or 3,100 feet if calculated from the level of the Precambrian peneplain). This was perhaps the world's largest pyritic sulfide orebody. This mine was the site of a sulfide ore mine fire in which the sulfide ores burned for several years (the fire started in 1894), forming a suite of new species (Lausen, 1928). Mining operations included various mechanisms to control the fire and its resulting fumes while the burning ore was mined. Workings throughout the period the property was in operation totalled 81 miles of underground workings. Workings reached to the 3,515 level. The workings included a total of 8 shafts, of which 2 were the principal shafts, the No. 3 shaft collar was at about 5,509 feet of altitude and descended vertically to the 1950-foot level; the No. 4 shaft collar was at about 5,530 feet of altitude and went to the 1000 foot level. The 1000-foot level tunnel was the main haulage adit (Hopewell tunnel = 6,600 feet long). There was a 1,200-foot long adit at the 500-foot level. The No. 6 shaft went from the 500-foot level to the 1950 level. The No. 5 shaft went from the 800 level to the 2500 level. 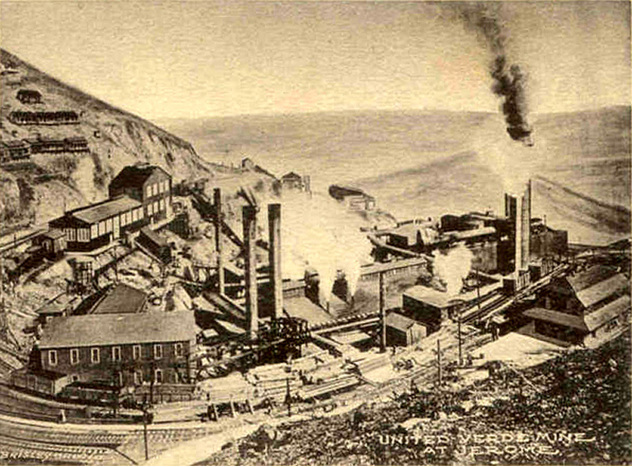 Production was 8,200,000 tons of ore to the end of 1918; or, 20,314,000 tons of ore (1880-1930). The ore yielded 1,959,098,900 pounds of Cu, 1,009,800 oz. Au and 34,586,000 oz. Ag. ⓘ var: Zincian Tennantite ? 58 valid minerals. 6 (TL) - type locality of valid minerals. Description: By-product of burning pyritic ores. Reference: Anthony, J.W., et al (1995), Mineralogy of Arizona, 3rd.ed. : 107; Lindgren, W. (1926), USGS Bull. 782: 26, 27, 28-29, 31, 32, 61-78; Reber, L.E., Jr. (1938), AZ Bur. of Mines Bull. 145: 49; Univ. of AZ Bull. 41 (1916-17), Mineralogy of Useful Minerals in AZ: 25, 27, 56; Galbraith, F.W. (1947), AZ Bur. of Mines Bull. 153, Minerals of AZ: 9, 12, 15, 16, 20, 24; Galbraith, F.W. 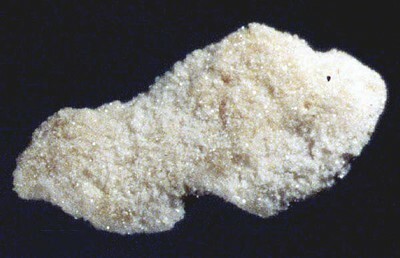 & Brennan (1959), Minerals of AZ: 63; Lausen, C. (1928), Hydrous sulphates formed under fumerolic conditions at the United Verde mine, AmMin: 13: 203-229. Description: In pyritic ore; in the black schist (chlorite schist). Reference: Anthony, J.W., et al (1995), Mineralogy of Arizona, 3rd.ed. : 147; Lindgren, W. (1926), USGS Bull. 782: 61-78. 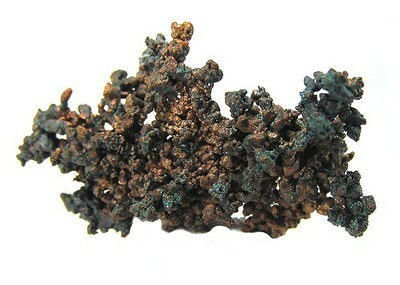 Description: On burned ore matrix. Reference: Anthony, J.W., et al (1995), Mineralogy of Arizona, 3rd.ed. : 120. Description: Occurs sparingly as small crystals throughout the orebody. Reference: Dana 6: 1094; Galbraith, F.W. & Brennan (1959), Minerals of AZ: 45. Reference: Dana 6: 1094; Lindgren, W. (1926), USGS Bull. 782: 61-78. 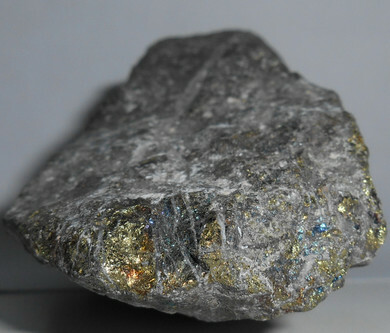 Description: Occurs as both a primary & secondary mineral. Reference: Anthony, J.W., et al (1995), Mineralogy of Arizona, 3rd.ed. : 143; Anderson, C.A. & S.C. Creasy (1958), Geology and ore deposits of the Jerome area, Yavapai Co., AZ, USGS PP 308: 91; Lindgren, W. (1926), USGS Bull. 782: 29; Lausen, C. (1928), Hydrous sulphates formed under fumerolic conditions at the United Verde mine, AmMin: 13: 203-229; Schwartz, G.M. (1938), Oxidized copper ores of the United verde Extension Mine, Econ.Geol. : 33: 21-33. 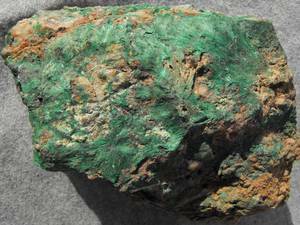 Description: Occurs lower part oxidized zone in chlorite schist. Reference: Dana 6: 1094; Palache, C., Berman, H., & Frondel, C. (1951), The System of Mineralogy of James Dwight Dana and Edward Salisbury Dana, Yale University 1837-1892, Volume II: 543; Anthony, J.W., et al (1995), Mineralogy of Arizona, 3rd.ed. : 147; Galbraith, F.W. & Brennan (1959), Minerals of AZ: 63. Description: Thin crystalline coatings from burning pyritic ores. Reference: Anthony, J.W., et al (1995), Mineralogy of Arizona, 3rd.ed. : 149; Lausen, C. (1928), Hydrous sulphates formed under fumerolic conditions at the United Verde mine, AmMin: 13: 203-229; Cesbron, F. (1964), Contribution à la minéralogie des sulfates de fer hydraté, Bull. Soc. Franc. Min. Crist: 87:125-143; Fanfani, L.A., et al (1971), The crystal structure of butlerite, Am.Min. : 56: 751-757; Galbraith, F.W. & Brennan (1959), Minerals of AZ: 66. Description: Common in late quartz-carbonate veins. Description: Stalactites to 2 feet long. Reference: Dana 6: 1094; Palache, C., Berman, H., & Frondel, C. (1951), The System of Mineralogy of James Dwight Dana and Edward Salisbury Dana, Yale University 1837-1892, Volume II: 490; Anthony, J.W., et al (1995), Mineralogy of Arizona, 3rd.ed. : 161; Guild, F.N. (1910), The mineralogy of Arizona; Univ. of AZ Bull. 41 (1916-17), Mineralogy of Useful Minerals in AZ: 27; Galbraith, F.W. & Brennan (1959), Minerals of AZ: 60. Reference: Anthony, J.W., et al (1995), Mineralogy of Arizona, 3rd.ed. : 164; Lindgren, W. (1926), USGS Bull. 782: 27; Schwartz, G.M. (1938), Oxidized copper ores of the United verde Extension Mine, Econ.Geol. : 33:21-33; Fearing, J.L., Jr. (1926), Some notes on the geology of the Jerome district, AZ, Econ.Geol. : 21: 757-773; Anderson, C.A. & S.C. Creasy (1958), Geology and ore deposits of the Jerome area, Yavapai Co., AZ, USGS PP 308: 94; Galbraith, F.W. (1947), AZ Bur. of Mines Bull. 153, Minerals of AZ: 16. 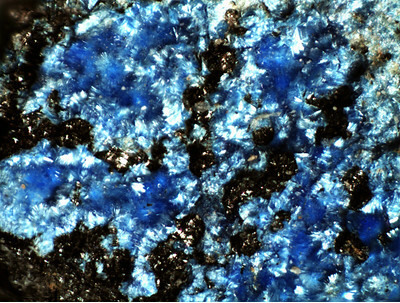 Description: Principal ore mineral in pyritic orebody. Description: Constit. of black schist that replaced rocks in region. Reference: Anthony, J.W., et al (1995), Mineralogy of Arizona, 3rd.ed. : 168; Anderson, C.A. & S.C. Creasy (1958), Geology and ore deposits of the Jerome area, Yavapai Co., AZ, USGS PP 308. Description: In black schist that replaced rocks in the region. Reference: Anthony, J.W., et al (1995), Mineralogy of Arizona, 3rd.ed. : 170; Anderson, C.A. & S.C. Creasy (1958), Geology and ore deposits of the Jerome area, Yavapai Co., AZ, USGS PP 308; Lindgren, W. (1926), USGS Bull. 782: 61-78. Reference: Anderson, C.A. & S.C. Creasey (1958), Geology and ore deposits of the Jerome area, Yavapai Co., AZ, USGS PP 308: 121. Description: Silky crystals filling small cavity above burned pyritic ores & as a foil. Reference: Anthony, J.W., et al (1995), Mineralogy of Arizona, 3rd.ed. : 175; Palache, C. (1934), Contributions to crystallography: Claudetite, minasragite, samsonite, native selenium, iridium, Am.Min. : 19: 194-205; Buerger, M.S. (1942), The unit cell and space group of claudetite As2O3 (abstract), Am.Min. : 27: 216; Galbraith, F.W. & Brennan (1959), Minerals of AZ: 30. Reference: Anderson, C.A. & S.C. Creasey (1958), Geology and ore deposits of the Jerome area, Yavapai Co., AZ, USGS PP 308: 121.; Anderson, C.A. & S.C. Creasey (1958), Geology and ore deposits of the Jerome area, Yavapai Co., AZ, USGS PP 308: 121. Description: A constituent of black schist that replaced rocks in the region. Reference: Anderson, C.A. & S.C. Creasy (1958), Geology and ore deposits of the Jerome area, Yavapai Co., AZ, USGS PP 308. Description: Incrustations nearly 1 cm thick, xls., xlline. masses from burning pyritic ores. Reference: Palache, C., Berman, H., & Frondel, C. (1951), The System of Mineralogy of James Dwight Dana and Edward Salisbury Dana, Yale University 1837-1892, Volume II: 530, 626; Anthony, J.W., et al (1995), Mineralogy of Arizona, 3rd.ed. : 186; Lausen, C. (1928), Hydrous sulphates formed under fumerolic conditions at the United Verde mine, American Mineralogist: 13: 203-229; Anderson, C.A. (1927), Voltaite from Jerome, Arizona, American Mineralogist: 12: 287-290; Anderson, C.A. (1927), Voltaite from Jerome, AZ, Am.Min. : 12: 287-290. Reference: Lindgren, W. (1926), USGS Bull. 782: 61-78; Anderson, C.A. & S.C. Creasey (1958), Geology and ore deposits of the Jerome area, Yavapai Co., AZ, USGS PP 308: 94. Reference: Anthony, J.W., et al (1995), Mineralogy of Arizona, 3rd.ed. : 186; Lausen, C. (1928), Hydrous sulphates formed under fumerolic conditions at the United Verde mine, AmMin: 13: 203-229; Anderson, C.A. (1927), Voltaite from Jerome, AZ, Am.Min. : 12: 287-290; Galbraith, F.W. & Brennan (1959), Minerals of AZ: 63. Description: Formed as by-product of burning pyritic ores. Reference: Anthony, J.W., et al (1995), Mineralogy of Arizona, 3rd.ed. : 186; Lausen, C. (1928), Hydrous sulphates formed under fumerolic conditions at the United Verde mine, AmMin: 13: 203-229; Anderson, C.A. (1927), Voltaite from Jerome, AZ, Am.Min. : 12: 287-290. Reference: Lindgren, W. (1926), USGS Bull. 782: 61-78. Reference: Anthony, J.W., et al (1995), Mineralogy of Arizona, 3rd.ed. : 230-231; Lindgren, W. (1926), USGS Bull. 782: 61-78; Wells, H.L. & S.L. Penfield (1885), Gerhardtite and artificial cupric nitrates, Am.Jour.Sci. : 30: 50-57; Anderson, C.A. & S.C. Creasey (1958), Geology and ore deposits of the Jerome area, Yavapai Co., AZ, USGS PP 308: 94. Description: Analysis of Lausen (1928) gave 2.26 wt.% CuO. Reference: Lausen, C. (1928): Hydrous sulphates formed under fumerolic conditions at the United Verde Mine. American Mineralogist 13, 203-229. Reference: Anthony, J.W., et al (1995), Mineralogy of Arizona, 3rd.ed. : 147. Description: Crusts of crystals perched on milky quartz. Reference: Anthony, J.W., et al (1995), Mineralogy of Arizona, 3rd.ed. : 200. 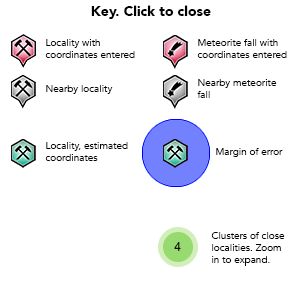 Description: Distinct crystals in the fire zone. Reference: Anthony, J.W., et al (1995), Mineralogy of Arizona, 3rd.ed. : 204; Harcourt, G.A. (1942), Tables for the identification of ore minerals by X-ray powder patterns, Am.Min. : 27: 63-113; Galbraith, F.W. (1947), AZ Bur. of Mines Bull. 153, Minerals of AZ: 9. Description: A fairly abundant gangue mineral; common in late quartz-carbonate veins. Reference: Anthony, J.W., et al (1995), Mineralogy of Arizona, 3rd.ed. : 207; Lindgren, W. (1926), USGS Bull. 782: 61-78; Anderson, C.A. & S.C. Creasey (1958), Geology and ore deposits of the Jerome area, Yavapai Co., AZ, USGS PP 308: 93; Galbraith, F.W. & Brennan (1959), Minerals of AZ: 30. Description: Small amounts; not in recoverable amounts. Description: Crystals to ¼ inch on fractures in massive cuprite. Reference: Wells, H.L. & S.L. Penfield (1885), Gerhardtite and artificial cupric nitrates, American Journal of Science: 30: 50-57; Dana 6: 1094; Palache, C., Berman, H., & Frondel, C. (1951), The System of Mineralogy of James Dwight Dana and Edward Salisbury Dana, Yale University 1837-1892, Volume II: 309; Anthony, J.W., et al (1995), Mineralogy of Arizona, 3rd.ed. : 230-231; Galbraith, F.W. & Brennan (1959), Minerals of AZ: 56. Reference: MRDS database Dep. ID #10109023, MRDS ID #M002664. Reference: Anthony, J.W., et al (1995), Mineralogy of Arizona, 3rd.ed. : 240; Lausen, C. (1928), Hydrous sulphates formed under fumerolic conditions at the United Verde mine, American Mineralogist: 13: 203-229; Laughon, R.B. (1970), New data on guildite, American Mineralogist: 55: 502-505; Galbraith, F.W. & Brennan (1959), Minerals of Arizona: 66. Description: Abundant in decomposed dikes. Reference: Anthony, J.W., et al (1995), Mineralogy of Arizona, 3rd.ed. : 242; Lindgren, W. (1926), USGS Bull. 782: 31, 61-78. Description: In jaspery masses between diorite & ore or in schist ore; in late veinlets cutting the massive sulfide orebody. 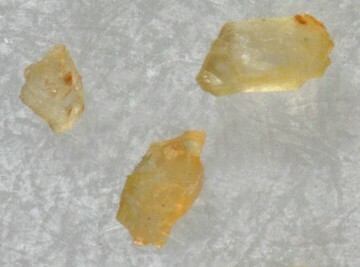 Description: Small blebs w. probable Zn-tennantite in chlorite matrix. Reference: Anthony, J.W., et al (1995), Mineralogy of Arizona, 3rd.ed. : 249. Description: Dusted over yavapaiite & other sulphates formed by burning pyritic ore.
Reference: Hutton, C.O. 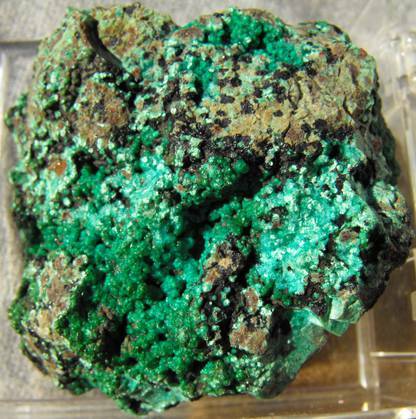 (1959a), Yavapaiite, an anhydrous potassium, ferric sulfate from Jerome, AZ: Am.Min. : 44: 1105-1114; Anthony, J.W., et al (1995), Mineralogy of Arizona, 3rd.ed. : 262. Description: On rocks beneath iron hoods over vents of burning pyritic ore.
Reference: Lausen, C. (1928), Hydrous sulphates formed under fumerolic conditions at the United Verde mine, Am.Min. : 13: 203-229; Anthony, J.W., et al (1995), Mineralogy of Arizona, 3rd.ed. : 262. Description: Occurs as result of burning pyritic ores. Reference: Palache, C., Berman, H., & Frondel, C. (1951), The System of Mineralogy of James Dwight Dana and Edward Salisbury Dana, Yale University 1837-1892, Volume II: 530; Anthony, J.W., et al (1995), Mineralogy of Arizona, 3rd.ed. : 272; Lausen, C. (1928), Hydrous sulphates formed under fumerolic conditions at the United Verde mine, American Mineralogist: 13: 203-229; Butler, G.M. (1928), Corrections to Volume 13, American Mineralogist: 13: 594; Galbraith, F.W. & Brennan (1959), Minerals of Arizona: 62. Description: In jaspery masses between diorite & ore or in schist ore.
Reference: Lindgren, W. (1926), USGS Bull. 782: 26, 61-78; Anderson, C.A. & S.C. Creasey (1958), Geology and ore deposits of the Jerome area, Yavapai Co., AZ, USGS PP 308: 92. Description: Occurs particularly with quartz porphyry and fine tuffaceous sedimentary rocks of the Grapevein Gulch formation. Description: Occurs with limonite in gossan. Reference: Galbraith, F.W. & Brennan (1959), Minerals of AZ: 110. Description: One of the largest pyritic orebodies in the world. Reference: . : Anthony, J.W., et al (1995), Mineralogy of Arizona, 3rd.ed. : 200. Description: Crusts & small tufts of xls. formed by burning pyritic ores. Reference: Palache, C., Berman, H., & Frondel, C. (1951), The System of Mineralogy of James Dwight Dana and Edward Salisbury Dana, Yale University 1837-1892, Volume II: 519; Anthony, J.W., et al (1995), Mineralogy of Arizona, 3rd.ed. : 352; Lausen, C. (1928), Hydrous sulphates formed under fumerolic conditions at the United Verde mine, AmMin: 13: 203-229; Wood, M.M. (1970), The crystal structure of ransomite, Am.Min. : 55: 729-734; Galbraith, F.W. & Brennan (1959), Minerals of AZ: 62. Description: Thin crusts on pyrite from fumerolic conditions by burning pyritic ore.
Reference: Anthony, J.W., et al (1995), Mineralogy of Arizona, 3rd.ed. : 356; Lausen, C. (1928), Hydrous sulphates formed under fumerolic conditions at the United Verde mine, AmMin: 13: 203-229; Wood, M.M. (1970), The crystal structure of ransomite, Am.Min. : 55: 729-734; Galbraith, F.W. & Brennan (1959), Minerals of AZ: 62. Description: As well-developed small crystals; common in the black schist (chlorite schist). Reference: Anthony, J.W., et al (1995), Mineralogy of Arizona, 3rd.ed. : 359; Anderson, C.A. & S.C. Creasey (1958), Geology and ore deposits of the Jerome area, Yavapai Co., AZ, USGS PP 308: 119; Lindgren, W. (1926), USGS Bull. 782: 61-78; Galbraith, F.W. & Brennan (1959), Minerals of AZ: 30. Habit: Needle-like, to 2 cm long, bounded by 1st. & 2nd. order rhombohedrons. 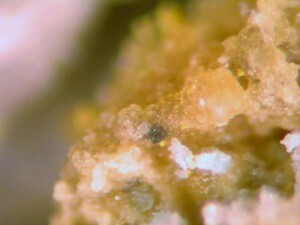 Description: Coatings of crystals on rock above burning pyritic orebody. Reference: Anthony, J.W., et al (1995), Mineralogy of Arizona, 3rd.ed. : 366; Galbraith, F.W. (1947), AZ Bur. of Mines Bull. 153, Minerals of AZ: 12; Palache, C. (1934), Contributions to crystallography: Claudetite, minasragite, samsonite, native selenium, iridium, Am.Min. : 19: 194-205; Korbel & Novak, 1999. Minerals Encyclopaedia, p.17. Description: As thin layer high-grade ore in gossan immediately above sulfide orebody. Reference: Anthony, J.W., et al (1995), Mineralogy of Arizona, 3rd.ed. : 373; Lindgren, W. (1926), USGS Bull. 782: 61-78; Reber, L.E., Jr. (1938), AZ Bur. of Mines Bull. 145: 49; Anderson, C.A. & S.C. Creasy (1958), Geology and ore deposits of the Jerome area, Yavapai Co., AZ, USGS PP 308: 94; Galbraith, F.W. (1947), AZ Bur. of Mines Bull. 153, Minerals of AZ: 9. Description: In pyritic ores; relatively abundant in low-grade pyritic masses. Description: Deposited under sofataric conditions by partial burning pyritic ore.
Reference: Anthony, J.W., et al (1995), Mineralogy of Arizona, 3rd.ed. : 386. Description: Abundant, last to form in paragenesis, veinlets in ore, replaces any older minerals. Description: Anderson & Creasy provides analysis. Reference: Anthony, J.W., et al (1995), Mineralogy of Arizona, 3rd.ed. : 391; Anderson, C.A. & S.C. Creasy (1958), Geology and ore deposits of the Jerome area, Yavapai Co., AZ, USGS PP 308.
ⓘ Tennantite var: Zincian Tennantite ? Description: Probable occurrence with hessite . Description: Presence noted in one thin section of the black schist (chlorite schist). Reference: Anderson, C.A. & S.C. Creasey (1958), Geology and ore deposits of the Jerome area, Yavapai Co., AZ, USGS PP 308: 119. 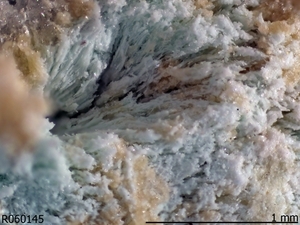 Description: Resinous crystals formed by burning pyritic ore.
Reference: Anthony, J.W., et al (1995), Mineralogy of Arizona, 3rd.ed. : 416; Lausen, C. (1928), Hydrous sulphates formed under fumerolic conditions at the United Verde mine, AmMin: 13: 203-229; Anderson, C.A. (1927), Voltaite from Jerome, AZ, Am.Min. : 12: 287-290; Hutton, C.O. (1959a), Yavapaiite, an anhydrous potassium, ferric sulfate from Jerome, AZ: Am.Min. : 44: 1105-1114; Galbraith, F.W. & Brennan (1959), Minerals of AZ: 59. Reference: Anthony, J.W., et al (1995), Mineralogy of Arizona, 3rd.ed. : 262, 428-429; Anthony, J.W., et al (1972), The crystal structure of yavapaiite: A discussion, Am.Min. : 57: 1546; Graeber, E.J. & A. Rosenzweig (1971), The crystal structure of yavapaiite KFe(SO4)2 and goldichite, KFe(SO4)2·4H2, Am.Min. : 56: 1917-1933; Hutton, C.O. 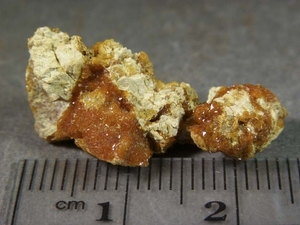 (1959a), Yavapaiite, an anhydrous potassium, ferric sulfate from Jerome, AZ: Am.Min. : 44: 1105-1114; Nickel & Nichols (1991), Mineral Reference Manual: 233. Description: Common in the black schist (chlorite schist); commonly surrounded by pleochroic haloes as large as 0.006 mm across; larger crystals haloes to 0.07 mm across. Comments: ~ 1.6 - 1.8 Ga Original map source: Arizona Geological Survey, DI-8 Geologic Map of Arizona, Digital Spatial data for the Geologic Map of Arizona, v. 3.0, edited by S.M. Richard and S.M. Kneale, 2002, 10 p., 2 DOS HD disks. Arc/INFO export file (.e00) format, scale 1:1,000,000. Wells, H.L. and Penfield, S.L. (1885) Gerhardtite and artificial cupric nitrates. American Journal of Science: 30: 50-57. Dana, E.S. (1892) System of Mineralogy, 6th. Edition, New York. : 1094. Guild, F.N. (1910) The Mineralogy of Arizona. The Chemical Publishing Co., Easton, PA.
University of Arizona Bulletin 41 (1916-17) Mineralogy of Useful Minerals in Arizona: 25, 27, 56. Reber, L.E., Jr. (1922) Geology and ore deposits of Jerome district, in A.I.M.E. Transactions, Vol. 66: 3-26. Fearing, J.L., Jr. (1926) Some notes on the geology of the Jerome district, Arizona. Economic Geology: 21: 757-773. Lindgren, W. (1926) Ore deposits of the Jerome and Bradshaw Mountains quadrangles, Arizona. USGS Bulletin 782: 26, 27, 28-29, 31, 32, 61-78. Anderson, C.A. (1927) Voltaite from Jerome, Arizona. American Mineralogist: 12: 287-290. Butler, G.M. (1928) Corrections to Volume 13. American Mineralogist: 13: 594. Lausen, C. (1928) Hydrous sulphates formed under fumarolic conditions at the United Verde Mine. American Mineralogist: 13: 203-229. Ingalls, W.R. (1931) World Survey of the Zinc Industry. Mining and Metallurgical Society of America, 128pp. Palache, C. (1934) Contributions to crystallography: Claudetite, minasragite, samsonite, native selenium, iridium. American Mineralogist: 19: 194-205. Reber, L.E., Jr. (1938) Arizona Bureau of Mines Bulletin 145: 49. Schwartz, G.M. (1938) Oxidized copper ores of the United Verde Extension Mine. Economic Geology: 33: 21-33. Buerger, M.S. (1942) The unit cell and space group of claudetite As2O3 (abstract). American Mineralogist: 27: 216. Harcourt, G.A. (1942) Tables for the identification of ore minerals by X-ray powder patterns. American Mineralogist: 27: 63-113. Galbraith, F.W. (1947) Minerals of Arizona. Arizona Bureau of Mines Bulletin 153: 9, 12, 15, 16, 20, 24. Anderson, C.A. and Creasy, S.C. (1958) Geology and ore deposits of the Jerome area, Yavapai County, Arizona. USGS PP 308: 91, 92, 93, 94, 101-130. Galbraith, F.W. and Brennan (1959) Minerals of Arizona: 30, 45, 51, 56, 59, 60, 62, 63, 66, 67, 110. Hutton, C.O. 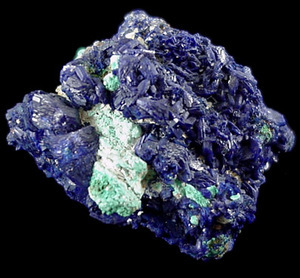 (1959), Yavapaiite, an anhydrous potassium, ferric sulfate from Jerome, Arizona. American Mineralogist: 44: 1105-1114. Cesbron, F. (1964) Contribution à la minéralogie des sulfates de fer hydraté. Bull. Soc. Franc. Min. Crist: 87: 125-143. Moxham, R.M. et al. (1965) Gamma-ray spectrometer studies of hydrothermally altered rocks. Economic Geology: 60: 653-671. Alenius, E.M.J. 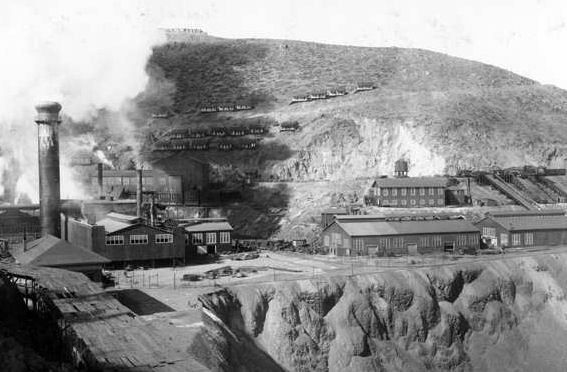 (1968) A Brief History of the United Verde Open Pit, Jerome, Arizona. Arizona Bureau of Mines Bulletin 178: 33. Laughon, R.B. (1970) New data on Guildite. American Mineralogist: 55: 502-505. Wood, M.M. (1970) The crystal structure of ransomite. American Mineralogist: 55: 729-734. Fanfani, L.A. et al. (1971) The crystal structure of butlerite. American Mineralogist: 56: 751-757. Graeber, E.J. and Rosenzweig, A. (1971) The crystal structure of yavapaiite (KFe(SO4)2 and goldichite, KFe(SO4)2·4H2). American Mineralogist: 56: 1917-1933. Anderson, C.A. and Nash, J.T. (1972) Geology of the Massive Sulfide Deposits at Jerome, Arizona – A Reinterpretation. Economic Geology: 67(7): 845. Anthony, J.W. et al. (1972) The crystal structure of yavapaiite: A discussion. American Mineralogist: 57: 1546. Niemuth, N.J. (1987) Arizona Mineral Development 1984-1986. Arizona Department of Mines & Mineral Resources Directory 29, 46 pp. Nickel and Nichols (1991) Mineral Reference Manual: 233. Blair, Gerry (1992) The Rockhound's Guide to Arizona. Helena, MT, Falcon Press. Niemuth, N.J. and Phillips, K.A. (1992) Copper Oxide Resources. Arizona Department of Mines & Mineral Resources Open File Report 92-10: 18 (Table 1). Sawyer, M.B., Gurmendi, A.C., Daley, M.R., and Howell, S.B. (1992) Principal Deposits of Strategic and Critical Minerals in Arizona. U.S. Bureau of Mines Special Publication, 334 pp. Economic Geology (1992) 87: 29-49. Anthony, J.W. et al. (1995), Mineralogy of Arizona, 3rd.ed. : 107, 120, 143, 147, 149, 161, 164, 167, 168, 170, 175, 177, 184, 186, 200, 204, 207, 230-231, 240, 242, 247, 249, 262, 272, 309, 341, 352, 356, 359, 366, 373, 378, 386, 391, 393, 416, 428-429. USGS (2005) Mineral Resources Data System (MRDS): U.S. Geological Survey, Reston, Virginia, loc. file ID #10109023, MRDS ID #M002664; and, file #10186256. Hansen, M.G. (xxxx) Diamond Drilling at the UV Mine. U.S. Bureau of Mines Information Circular 6708. USGS Munds Draw Quadrangle map. Arizona Department of Mineral Resources United Verde file. U.S. Bureau of Land Management Mining District Sheets 54 & 56. U.S. Bureau of Mines, Minerals Availability System (MAS) file ID #0040251537.